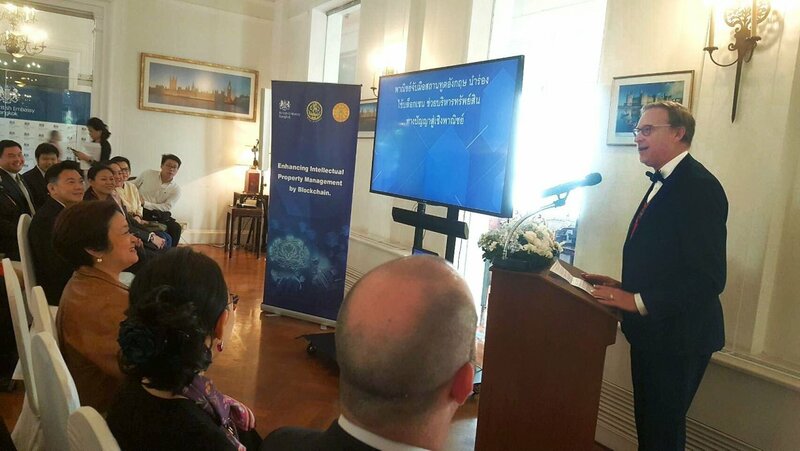 The event was conducted by the Trade Policy and Strategy Office (TPSO) and the British Embassy, with Thammasat University as an advisor for the project. Davidson said the UK is a strong supporter of free trade, open competition and adoption of new technology in order to create a more enabling business environment. The work on blockchain is one of several areas where the UK is partnering with the Thai government to support the Kingdom’s efforts to improve its business environment. The British Embassy sees great potential in blockchain, more properly called “distributed ledger technology”, for improving many areas of the business ecosystem, including Intellectual Property (IP) management. IP’s potential for commercialisation has drawn the UK to work with the partners. Blockchain technology can revolutionise or disrupt the economy, society and even politics in an unprecedented manner, says TPSO’s director-general Pimchanok Nan Vonkorpon. Areas of public administration and public service provision have particular potential for blockchain. She added that Its key characteristics – increasing transparency, the ability to send information to many stakeholders in the chain at the same time, and the difficulty in changing information once it is entered into the system – positions blockchain as important for “Trust Building”, which is an integral part of the digital era trade ecosystem. TPSO believes that blockchain can be applied in many use cases under the aegis of the Ministry of Commerce, especially those that involve registration, traceability, ownership, e-commerce and trade facilitation, among others. Pimchanok said blockchain has great potential in reducing fraud risk or contractual disputes between contracting parties, and also lowering transaction costs for SMEs and traders. Therefore, TPSO has initiated study projects that explore the feasibility of using blockchain technology in several area, including trade facilitation, intellectual property and agriculture. Professor Dr Arnat Leemakdej, director of the Centre of Intellectual Property and Business Incubator, Thammasat University is an advisor to the project. He said the distributed ledger technology can store various types of transaction data on a decentralised network by ensuring that the collected data is accurate, complete, secure, immutable and verifiable. Applying blockchain technology could enhance IP management, he said. For example, blockchain can keep IP registration data and the transactions from IP work, and so detect evidence of ownership and authentication. It can identify or authenticate a creator who owns the “creatorship”, or the licensee. A Smart Contract providing a self-executed agreement between the parties could be utilised to manage the whole process of IP from filing to licensing. Together with other technologies such as AI (Artificial Intelligence) and IoT (Internet of Things), IP management in Thailand could be significantly improved. Eight potential projects are proposed under this feasibility study and are divided into two stages: one-year quick-win projects, and intermediate-term two- to three-year projects. In one quick-win project, the existing IP database in the IP Mart system of the Department of Intellectual Property will be imported into the public blockchain. Another quick-win project will study and develop standards to store the copyright database on blockchain focusing on literary works by collaborating with e-book service providers. Several intermediate-term projects are proposed, with one to evaluate IP values, and another to develop a system for Geographical Indication (GI) registration and management including a traceability system. In addition, there are proposals to develop IP management system on a blockchain network for patents, trademarks and copyrights that include IP registration, IP rights transfer, IP license management, IP enforcement and IP as a form of collateral.